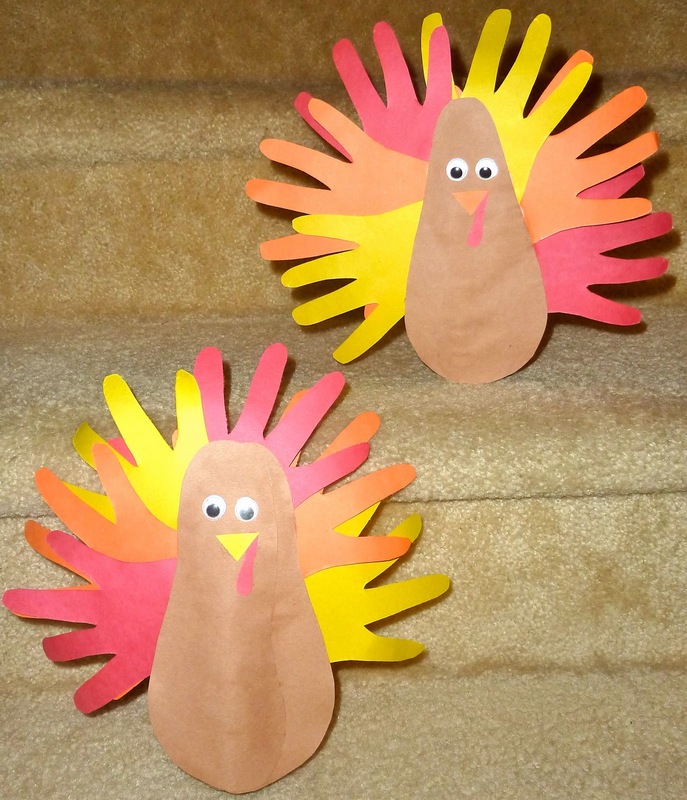 By now you know I am addicted to have a fondness for hand & foot print crafts. Why? They make wonderful keepsakes. It's an easy way to hold onto a little bit of your child's childhood. 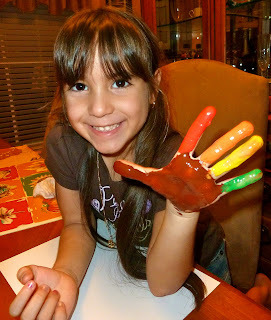 Every year (for the past 3 years), I have helped the Lil Divas make a hand & foot print turkey. I LOVE seeing these cute little guys on display. The turkeys appear so much bigger to me this year - makes me a bit sad. My babies are growing so fast. This is exactly the reason why I enjoy having these keepsakes. It freezes time just a little bit and I get to enjoy these small hands & feet that will never be this size again. 1. The Lil Divas traced their hand & foot print. the tracings are far from perfect but they are all their own which is fabulous! 2. The Lil Divas cut out their footprints. I folded the paper over so they made/cut 2 at a time. 3. I cut out the handprints since we needed 6.
we used 2 overlapping footprints and glued them together as seen below. 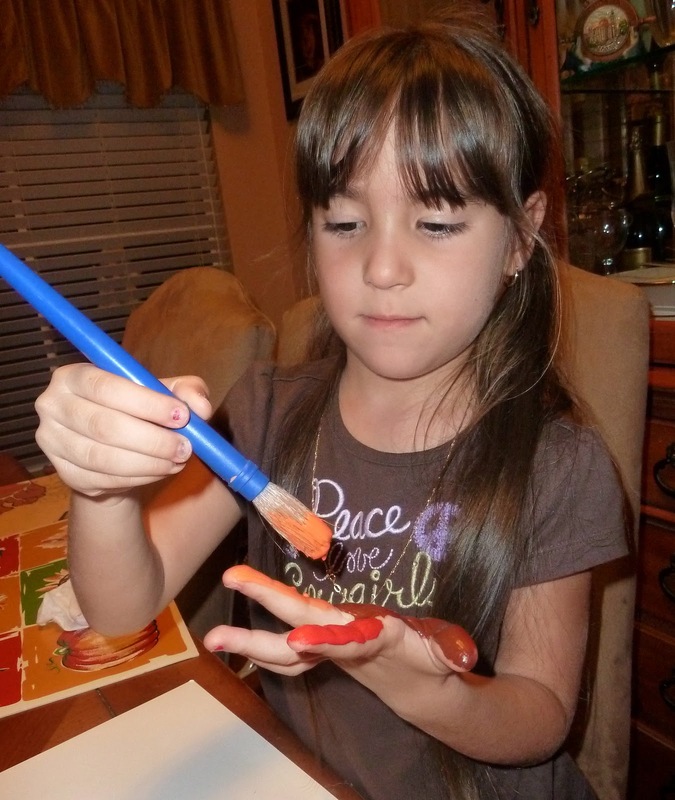 glue the 6 handprints in various colors to the back of the body (see below). 6. 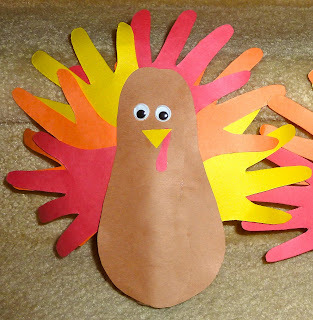 Attach the turkey to a TP roll to enable it to stand up. & they make the cutest centerpieces/decoration. Every year each of the Lil Divas also makes a painted handprint turkey. I LOVE seeing those little handprints. they get from year to year. This year even the youngest got to do it on her own. 1. 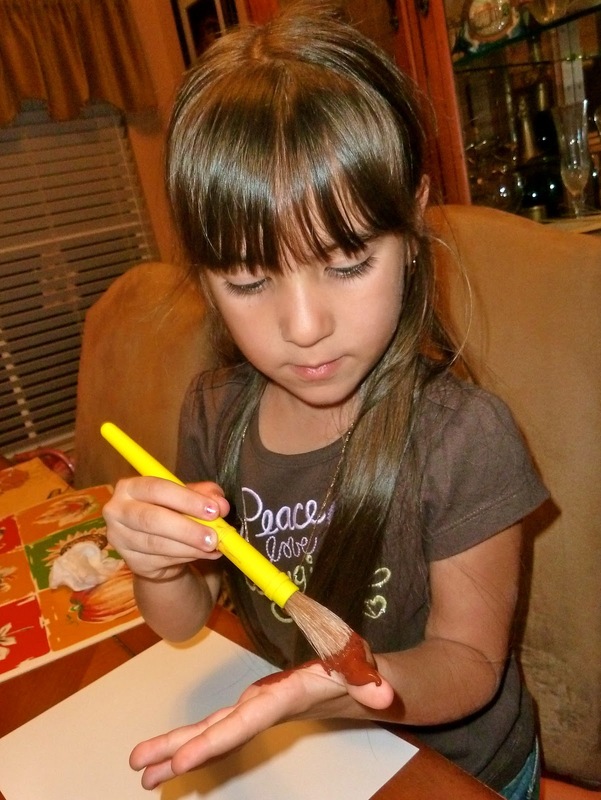 Paint the palm & thumb brown for the turkey's body. 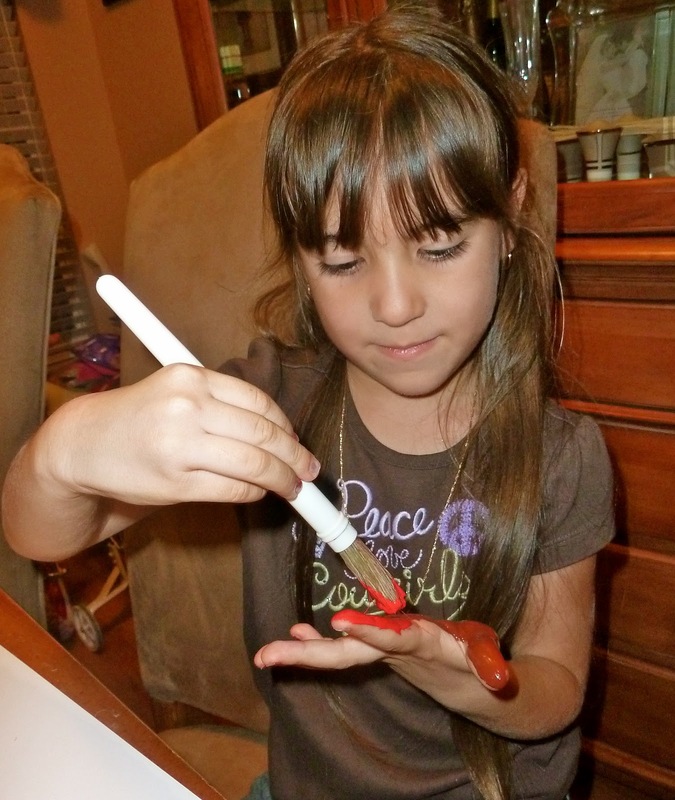 My Littlest Diva enjoyed the hand painting paint part immensely and managed to keep the paint solely on her hand = Fabulous! 3. Press handprint firmly onto card stock. 4. Add an eye, beak, waddle & feet to complete the turkey (see below). I plan to add a photo of these adorable handprints to our family calendar for next year. I know the grandparent will enjoy seeing these little gems. Can we move in with you? Just through the holidays? Love to paint, craft, decorate! Wonderful fun ideas on your blog and love the linkies. Your crafts always look like so much fun. I would love for you to share this on my linky party, Hey Mom, Look What I Did at Adventures In Mommy Land (http://adventures-in-mommy-land.blogspot.com/2011/11/hey-mom-look-what-i-did-7.html). 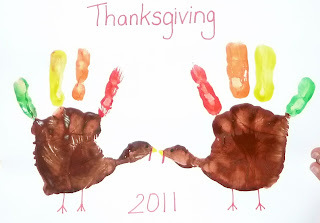 I love the handprint turkeys! I stole your idea and used them for a Thanksgiving card to send to the grandparents. You've been nominated for the Versatile Blogger Award. Come check it out. Very cute there friend- love it! thank you for sharing these wonderful kid crafts!..My little one would surely love to make the handprint turkey!:).. 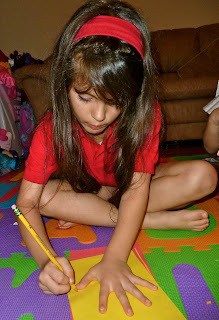 Thank you for sharing on Hey Mom, Look What I Did at Adventures In Mommy Land...hope to see you again soon! !